<?xml:namespace prefix = o ns = "urn:schemas-microsoft-com:office:office" /> Beverly Firefighter Albert Petronzio Jr. graduated from the Massachusetts Firefighting Academy Recruit Program on Friday, September 26. The recruit program is designed to teach firefighters the basic skills required to perform efficiently on a fireground. The program lasts 12 weeks and includes physical fitness standards, classroom training, practical rescue training and live fire training in the Academy�s burn building. Upon graduation, Firefighters have been trained to the certification levels of Firefighter I&II and Hazardous Materials Responder Operational Level by the Massachusetts Fire Training Council. Firefighters Mark Brewer and Ryan Laracy began their recruit training on Monday September 29. Firefighters from Beverly and Danvers made the trip to Elkton Maryland to take part in another Scott Firefighter Combat Challenge. Beverly Fire Lieutenant Russell Halloran made the trip with Danvers Firefighters Craig Vesey and David Mondi on September 20. The second time around proved to be quite an improvement for Halloran who bettered his time by nearly 30 seconds. In Haverhill, Halloran ran the course in 3 minutes and 3 seconds including a penalty of 10 seconds. In Maryland, he ran through the course in 2 minutes and 34 seconds. �It really is an addicting experience,� said Halloran. �It definitely is the toughest two minutes in sports� he continued. Halloran has been training since the Haverhill competition with different techniques that he credits with enabling him to better his time on the course. Although there is another race in St. Louis Missouri approaching, Russell will continue to train for next year�s events a little closer to home. 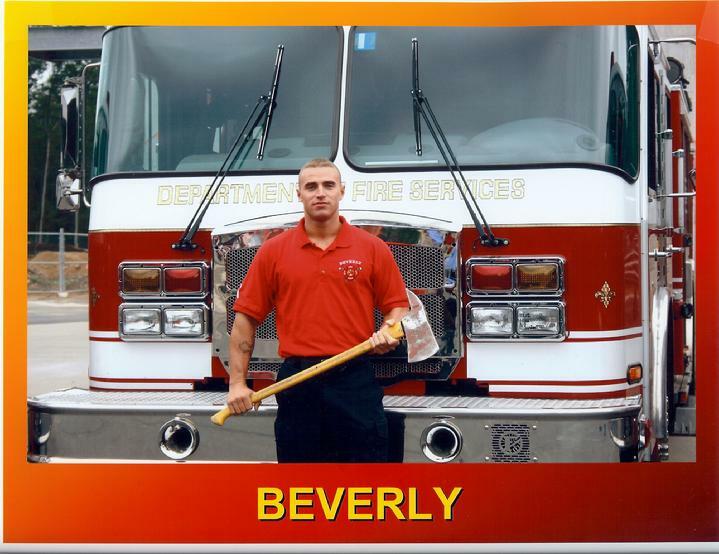 Russell and other Beverly Firefighters took part in the August Challenge in Haverhill. It was the first time that Beverly Firefighters had competed in the event. All of the Beverly firefighters that took part in the August event are planning to take part in future events closer to home. Firefighters dig out charred contents after a fire erupted under a porch at 2 Stewart Ave. The Beverly Fire Department was dispatched to a report of a building fire at 2 Stewart Ave at 0403 on Wednesday September 24. Upon arrival, Deputy Chief Paul Cotter found smoke and fire coming from under a porch on the side of the 3 story multifamily building. The homeowner was in the process of keeping the fire at bay with a small garden hose. Crews from Engine 4 and Ladder 1 pulled the coverings from the sides surrounding the space under the porch while Crews from Engine 1 used a hose line from Engine 1 to fully extinguish the fire. Fire crews also used a fan to remove smoke that filled all three floors of the home. The fire was found after a first floor tenant reported smelling smoke. The fire was located and the house was evacuated prior to the arrival of the fire department. �The homeowner prevented further damage to his home while remembering to get everyone out first� said Deputy Chief Paul Cotter. �He was able to fight the fire from a safe location reducing the amount of fire damage that occurred� he continued. If homeowners make the decision to fight a fire, they must carefully consider their safety and the safety of other occupants first. By making sure the home was evacuated, the homeowner ensured that if the fire couldn�t be controlled, no one else would be trapped in the house. By calling the fire department then fighting the fire from a safe outside location, he ensured his own personal safety by making sure that he had somewhere to go if the fire grew out of control and fire crews were on the way without delay. Damage was confined to the area around the porch and the contents underneath the porch. Firefighters were able to determine that the fire had not extended into the structure above the fire. None of the ten occupants of the home were displaced. One firefighter suffered a minor eye injury and was treated at the scene. No civilians reported any injuries. After an investigation, the fire origin was found to be a bed of bark mulch adjacent to the wooden trim on the side porch. Careless disposal of smoking material most likely caused a smoldering fire in the mulch, which extended to the wood trim, then the contents stored under the porch. The cause of the fire was investigated by Lieutenant Robert Bergeron. A fire extinguisher sits by the pan of oil that ignited atop a burner. Three separate incidents of overheated cooking oil resulted in fires that the Beverly Fire Department has responded to in the last week. The alarming trend reflects the National trend for the leading cause of house fires, cooking incidents. The first incident occurred at 1045PM on August 15 when a resident at 22 Home St accidentally overheated a pan of cooking oil igniting a fire that quickly spread to the bottom side of the range hood and damaged some cabinets. The homeowner used a garden hose to knock the fire down prior to the arrival of the Fire Department. The second incident occurred Sunday September 21 at 81/2 Pickett St when another pot of oil was allowed to overheat and ignite on the stove. Fortunately for the resident, a neighbor heard her screams and was able to knock down the fire with a portable fire extinguisher. The third incident occurred at the Callahan Center of Endicott College when a burner was accidentally raised to a higher heat with a pot of oil on it. The temperature of the oil raised to its ignition temperature and flames erupted from a pot. A quick thinking worker placed another pan over the pot in an effort to smother the flames, but the flames continued until a worker discharged a fire extinguisher knocking down the fire. This was the first such incident in recent history at the Callahan Center where there is a very good record of safe practices and droves of students flock to eat every day. Cooking oils, though an invaluable tool in the kitchen, can be quite hazardous. With easily attainable ignition temperatures, the oils can quickly ignite when left unchecked on the stove. The fast moving fires can quickly spread beyond the pot causing significant damage if not extinguished immediately. �The best defense is diligence� said Deputy Chief William Walsh. �Never leave any food on the stove unattended� he continued. If you do have a cooking oil fire, the best defense is usually calling 911, covering the pot with a tight fitting lid and turning off the heat. Doing so deprives the fire of needed oxygen and also removes the heat lowering the oil below its ignition temperature. A fire extinguisher is also an important tool as long as you know how to use it. Fire extinguishers vary in types and sizes. Some extinguishers are meant for use on very specific materials. Before you try to use a fire extinguisher, call 911 then ensure that it is rated for the type of fire you are trying to put out. Improper application of a fire extinguisher can result in making the fire worse and possible personal injury. Most extinguishers designed for kitchens are designed to be discharged from up to 10 feet away from the fire. This distance keeps the user away from the fire and prevents the extinguishing agent from blasting the flaming oil out of the pan and all over the surroundings. Whenever there is any doubt about the capabilities to extinguish a fire, the best course of action is to get out and call 911. Fore more tips on cooking and fire safety, see the Beverly Fire Department Web site at beverlyfire.org or the U.S. Fire Administration at USFA.DHS.GOV. The Beverly Police and Fire Departments held a joint Child Passenger Safety Checkpoint on Saturday September 20. The event took place at the Memorial Building parking lot on Cabot St between 10 am and 1 pm. Working together, Police Officers and Firefighters specially trained to install and check car seats gave 25 different caregivers a free inspection of their child�s seat. By the end of the day more than a half dozen seats were replaced and every parent that came in left with an education about transporting their children safely. The checkpoint kicked off National Child Passenger Safety week and was partly sponsored by the Massachusetts Executive Office of Public Safety. Burned remains of a vent fan and an oil filled pan remain after a cooking fire on Home St.
At 2245 on September 15, Engines 1, 4, Ladder 1 and Deputy Chief Paul Cotter were dispatched to 22 Home St. for a report of a house fire. Upon arrival, Deputy Cotter found an extinguished fire in the kitchen on the first floor of the home. It was determined that oil was left unattended heating on the stove top. The oil ignited sending flames up into a vent over the stove and around the vent to the cabinets. Occupants used a garden hose to knock down the fire. Damage was confined to the area of the stove, vent hood and cabinets above and adjacent to the stove. At 2204 on Monday September 15, the Beverly Fire Department responded to the area of Porter St by Gills Park for an unknown type of problem in the river. Engine�s 1,4, Ladder 1, and Deputy Chief Paul Cotter initially responded. In the area, they found no immediate signs of a problem but were relayed reports that people were screaming in the water. Crews stood by until 2241 when the Beverly Police were able to determine that it was a police matter with no person remaining in the water. The Beverly Fire Department responded to three motor vehicle accidents with personal injury on September 15. The most serious accident occurred on Route 128 north between exits 18 and 17 where a motor vehicle left the roadway leaving the operator with significant traumatic injuries. The woman was transported to Beverly Hospital by Northeast Regional Ambulance. The second accident occurred on a stretch of rt 128 north along the rest area after Brimbal Ave. One woman was transported from the scene with minor injuries. Later a third accident sent a woman to the hospital after a collision occurred on Hale St by Mingo Beach. The Beverly Fire Department responded to a report of a public safety hazard at Obear Park on Livingston Ave. When Deputy Chief Paul Cotter arrived, he found the sheet metal roof of the burned out bath house blowing in the fierce winds travelling down the river. Deputy Cotter requested the help of Public Works and the Beverly Police at the scene. While Beverly Police and firefighters escorted onlookers from the scene, a backhoe was used to push the failing roof into the structure where it was no longer being blown by the wind. The structure fell victim to a fire which had destroyed most of the wooden structure under the sheet metal roof. The lack of structure underneath allowed the wind to more easily lift up the sheet metal covering. Once the roof was forced into the building, the park was reopened. At 0414 on September 13, the Beverly Fire Department responded for a report of a building fire at Cityside Diner, 275 Cabot St. When Deputy Chief William Petrosino arrived, he found a fire in a wall adjacent to a stove. Crews from Engine 1, Engine 4, and Ladder 1dug out and extinguished the fire which was climbing up the inside of the wall and making its way into the ceiling. Crews worked for approximately 45 minutes extinguishing the fire and ensuring that there was no further extension. The fire was caused by heat from the cooktop that was conducted through a sheet metal wall covering to the combustible wall coverings underneath the sheet metal. The health department was notified and responded as is required when there is a fire in a restaurant.